I all I have another article out in the newest edition of the Doberman Network Magazine. This time it's all about Puppy Contracts, The Art of Puppy Contracts, in fact. Hi Karen... How do I get to your article? When I use the link, I get a picture of Foxfires Julius (a magnificent dog). I can't really see where to go from there. Just as Lady Di said. My article is more towards the back, I think page 132 but I could be mistaken. I do love the stud issue though, it's my favorite. I was so disappointed to see not one, but two articles by Jean Dodds this issue. Especially one questioning emerging science on nutritional DCM. It's too bad Doberman folks haven't learned their lessons with her and her lack of scientific ethics or commitment to scientific methods. I'll take a read through your article, though - I didn't make it that far because I had to stop when I got to those articles. Exciting that you're getting writing experience in! The stud issue is my favorite issue so I'm waiting to get the paper copy so I can take my time. You should reach out to the magazine and let them know your feelings on it. G-Red - I your research on contracts - did you notice a big difference between the top of the line type breeders than -- say -- a lower breeding line ? Over the many years of Having Dober's - With some of our first ones - the contracts were pretty simple - Kadin came from Jager Dobermans - Agent Cindy Lane - Smith - there contract covered all the bases to protect there puppies - and I can't blame them a bit - And the things they require to even be considered to receive one - example - must have fenced in area - which we did have and a large one at that . When I read about some that have posted that they lived in a apartment = no fenced in area - I wonder - how did they get a Doberman pup ? Honestly they were all over the place, amongst all the reputable breeders. My breeder has a very short contract but some of them were 10-12 pages long. It really depends on what kind of control the breeder wants to have over the puppies. Now this is my thinking G-Red - What if you were to do a ? Say - Second edition of puppy contracts - comparing the 2 between reputable to like a BYB ? Here is were I'm going - I have read where some pick up there new pup at 6 weeks old ! 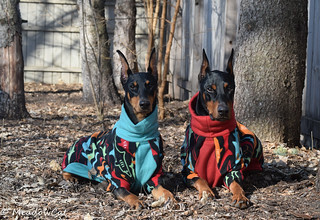 WAY to young to come home to new Dober parents - Yet it happens more than we think = the breeder is in it to make money and screw the pup - bucks rule ! Were I'm going is if you were to compare good to bad - and even if only one person was to read your article as to watch out for - then it would be a great success - Even in todays world of internet - there are bad people out there breeding this great breed -- Not for the better - but for money and that's it .